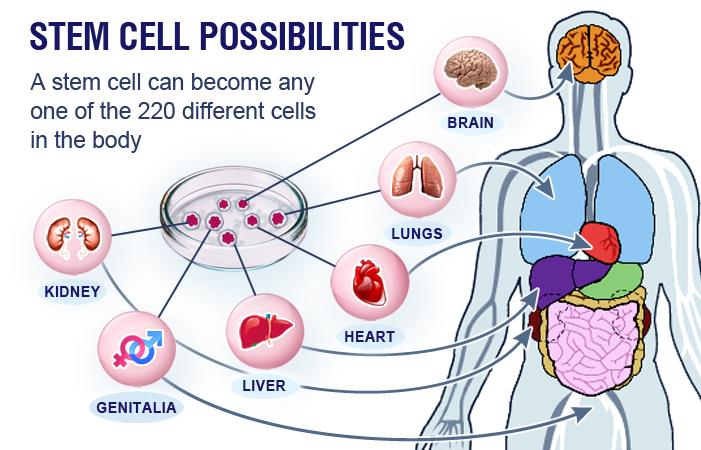 Stem cells are the key cells of the body capable of being the whole organism. The first two cells of the fertilized egg are known as germ cells and from there; the science of stem cells develops. Using the contemporary in vitro techniques it is possible to isolate these cells with the same integrity and genetic make up. These cells can be aimed to replace dead or damaged cells, and thereby help to alter the diseased condition. Though the technique is relatively novel, it has gained tremendous fame in recent years due to its broader applications and benefits in the regenerative medicines. The world is fighting over with the many deadly and debilitating diseases such as cancer, neurological impairments, diabetes, etc. People are seeking a great medical advancements to free them from emotional trauma, medicines and supportive therapies. In that sense the unlimited potential of stem cells can be harnessed to treat these diseases. Must be wondering how these tiny cells can be so potent to fight over with giants such as cancer. As we all know that the cells are the structural and hereditary units of each and every organ. Each and every cell is connected with the other one to make up the tissue. Tissues are connected with the other tissues to make up the organs. Cells are interacting with each other to perform the daily, tissue specific tasks and thus the functioning of the organ is controlled. When due to certain injury or trauma, these cells are damaged, there is an immediate impact on the normal functioning of the organ which will eventually lead us to diseased conditions. Stemcells are known as the master cells of the body, which are capable of becoming any cells if guided in a proper direction. This ability coupled with the modern in vitro technology can be very useful in regenerating lost cells, thus restoring the lost function of the organ. Amongst the various types of cells Adult cells are the most potential candidates opted by the experts since the embryonic cells are often associated with the many ethical hurdles and other abnormalities such as tumor development. Whereas the induced pluripotent cells, being the most recent are still passing through an experimental development. Adult stem cells are the reservoir of cells, present in an adult body. They may be bone marrow cells or cells isolated from adipose tissues. Each and every adult organ has a reserved quota of these smart cells, which is helping the organ to get control over the loss due to normal wear and tear. By learning this, an immediate question that arises is why do we need an external help of stem cell treatment, if we already have them stored within us? When our body goes through the diseased condition, these organ specific cells work hard to make over with the loss. But somewhere with the progression of the disease, the ability of these cells is diminished due to overwork and an extra supply of cells is needed in that instant. In such cases, stem cell treatment will be the way, we can take our cells from other known sources, process and concentrated them in the laboratory and implant them back into the target to fight with the diseases. These cells will then boost up the process of regeneration. Since our body’s own cells are used, it will avoid another possible complication such as immune rejection or opportunistic infections. Etc. With the great Medical advancements, stem cell science has shown tremendous improvement in treating various diseases and deadly conditions, thus proving us how powerful stem cell treatments can be! The science is moving fast, everyday brings a new promise of ways to shape and control different types of stem cells, bringing us a step closer to the treatment of the diseases. With this development, we should be tremendously optimistic, that the stem cell treatment will someday be included as a routine treatment regimen.